RAMBLER TO THE TIMES … Let the Bigfoot Record Show! WALLA WALLA --- I guess it was a blurb on the Internet, but wherever I saw it, the promo piece for a new bigfoot book made me “bite” and order it up from my book seller, Dave Cosby, at Earthlight Books. Well and good, that having been said, I would have to agree with the author, Christopher Murphy, to the above wordage. But, not with these: “While the last chapter on sasquatch has yet to be written, here is the full story of what we know about the creature to date.”Listed as associates of his in publishing the book are veteran bigfoot tracker, John Green, and another who has been active in the field, Thomas Steenburg. Even with these two sasquatch-savvy stalwarts aiding and abetting him, Murphy would find it real hard to come up with the “full” story. In my perusal of the book … mighty fine in all the points stated above, too! … I found it lacking in some key parts to this whole bigfoot enigma. There are so many gaps, actually as to make it far from the “full” story. I’d like to refer back a few lines to where Murphy commented on the “luck” of Paul Freeman in finding so many footprints. Fahrenbach also came to further defense of Paul Freeman in an address at this year’s Bigfoot Symposium, held in Willow Creek, California. “The body of evidence (emerging from investigations of reputable researchers) includes repeat appearances of identifiable individuals over successive years. 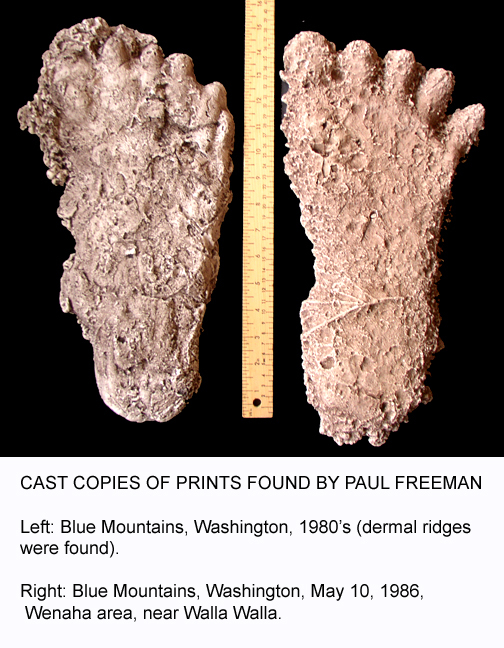 In this accounting of Paul Freeman and his bigfoot contributions, it should be mentioned two incidents which his detractors are pretty likely to bring up. Long before he came to Walla Walla to work for the Forest Service, Paul was living in Camas, Washington. Here, he whittled out two big feet and stomped around the neighborhood to confound the neighbors. It was a prank he acknowledged in the years following his 1982 sighting of a bigfoot in the Blue Mountains. There is also the story that he was involved in a man in a monkey suit, an incident I could easily put down as another prank or the work of a man “fed up “ with detractors. “Wayne Long, fire management officer of the Walla Walla District, talked at length with the two men when they were here. He spoke highly of their objectivity. “ They obviously came here to examine the Bigfoot issue; not pro- or anti-Bigfoot, just came here to examine the material and to ask questions. Both had seen hoaxes before about the Bigfoot thing. Sure enough, when we got out to look, there on the right side of the road was a huge human-like track … real fresh, too! And two more as it crossed the road in long strides and disappeared into the brush which dropped off into a little canyon. Inspection of the tracks revealed they evidently had been made just seconds before we rounded the curve to them. They were shiny appearing and real close scrutiny revealed dirt particles dropping. And, I know d---d well Paul Freeman sure did not make those tracks! In closing, the Murphy book is a great addition to the bigfoot chronicles but I feel he was quite remiss in ignoring Paul Freeman, his obvious sizable efforts in behalf of solving this puzzle, and the Blue Mountains, which must rate as one of the finest habitats for the creature. And, many researchers of repute have said as much.